Among the accessories launched alongside the Galaxy S8 last year, the DeX station took the cake for being one the most useful and innovative of the lot. There’s a lot to dislike about the DeX station; however, the idea of dropping your smartphone on a dock to use it as a computer, struck a chord with many consumers. Now, as we are inching closer to the launch of Galaxy S9, more details about a redesigned DeX station are emerging every other day. Although the company is expected to stick with the same design language for the phones, the DeX station, on the other hand, is expected to get a slight makeover. 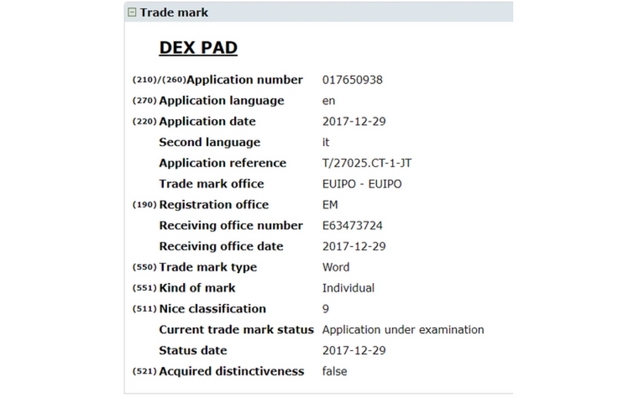 Looking at the trademark registered by Samsung at the EUIPO (European Union Intellectual Property Office), it appears that the new DeX station will come with a new form factor altogether. The company has registered ‘DeX Pad’ trademark, indicating that the new DeX station won’t require users to dock the phone but instead place it flat, as they would do on a wireless charging pad. In addition to that, the new form factor should also allow the smartphone screen to be used as a touchpad. And considering the fact that Android Oreo now enables users to employ a smartphone’s screen as an input device, Samsung might be looking to take advantage of this and eliminate the need for any additional peripherals. That being said, there are more questions than answers surrounding the DeX station right now. Luckily, we won’t have to wait too long as the new flagships are expected to make a splash by next month, at the very least.